This is a great take away handout for parent-teacher conference meetings! Use it to record students' strengths and areas of improvement using report card style grading. 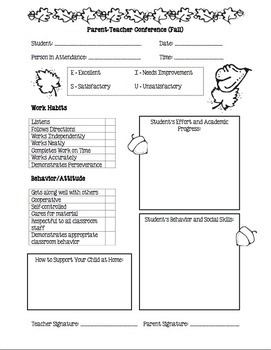 Handout also includes areas to document student's individual effort, academic progress, and behavior/social skills. Download this editable version and customize it to reflect your own classroom needs and preferences! PLEASE NOTE: The font used in the editable version is different than the thumbnail picture of the product. The editable version uses font "Century Gothic" which can be edited and changed to customer's preference.